Ring deprived Stefan was quick to point out to Sebastien that Puerto Madryn was one of the first cities in Argentina to introduce a Casamiento Express (Express Marriage) package for gay couples in which anyone can get married, with all the formalities in place in just 5 days. On top of this, there's so much to do here: you can swim with sea lion pups, have a few conversations with the cute Magellanic penguins, watch orcas, whales, get up close to Commerson's dolphins and relaxing on the beach. 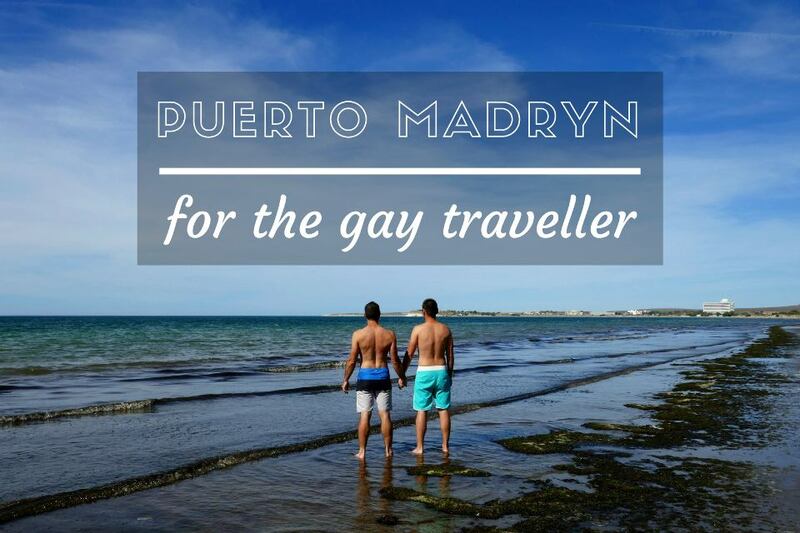 This is our gay travel guide to Puerto Madryn featuring the gay hangouts, places to stay and activities to do. Dazzler Hotel is one of Puerto Madryn's classiest hotels, modern and chic. It is located on the promenade, facing the ocean. Rooms are clean and spacious with some overlooking the sea front, which we definitely recommend for some killer sunrise views. There's a large rooftop space, which is a great spot for perving on the cute boys on the promenade below sunbathing (!!) Dazzler is also near some of the best restaurants in Puerto Madryn, such as Nautico Bistro de Mar and En Mis Fuegos. Rooms at the Dazzler Hotel start from $65 / £52 a night. It's very exclusive with only 8 rooms available. Full board packages include all meals, alcoholic drinks, transfers and 3 guided excursions. Rooms at El Pedral Lodge start from $550 / £440 a night. Rincon is a traditional Patagonian estancia (horse ranch), located on the Southeast corner of Peninsula Valdez, a UNESCO World Heritage site. 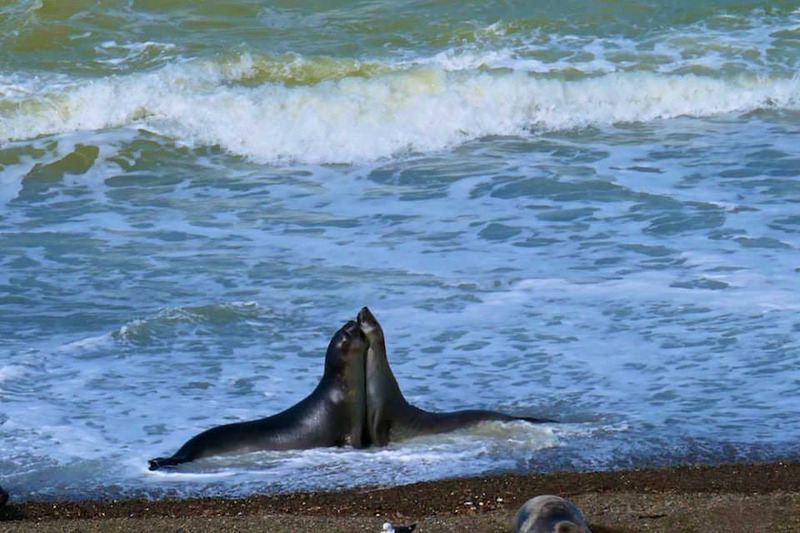 It is around 170km from Puerto Madryn and 70km from Puerto Pirámides village. It was constructed in the style of old English houses in the late 1800s, with the material imported from England. Its remoteness means there is no phone signal, with limited satellite Wifi powered by a generator for a few hours in the evening. Rates for rooms at the Rincon Chico Estancia have to be requested by email: rinconchico@rinconchico.com.ar. Puerto Madryn is not a party destination. You're better off staying in Buenos Aires if that's what you want. However, there are a few gay friendly bars and clubs recommended to us by LGBT locals. It is also worth noting that the promenade along the beach is where we saw a lot of gay boys hanging out. Margarita Pub: a fun gay friendly resto-bar, open from 7pm everyday with drinks promotions if you go early. Margarita is located at Roque Saenz Peña 15. La Frontera: one of the oldest clubs in Puerto Madryn going strong since 1997. It attracts a mixed crowd and is the main club the gay boys of the city hang out. They have live bands and free pizzas on Wednesdays and Fridays. La Frontera is located at 9 July 254 and is open every Wednesday and Friday from 10pm and Saturdays from midnight. Argentina Bar: gay friendly club near the bus station, playing the best Latino pop tunes and Colombia cumbia. They have live music on some nights and hard rock themed events. Argentina Bar is open on weekends from midnight and it is located at Hipólito Yrigoyen 296. Since gay marriage became legal in Argentina in 2010, Puerto Madryn introduced the Casamiento Express. This is an initiative open to all nationalities in which you can get married in just 5 days. 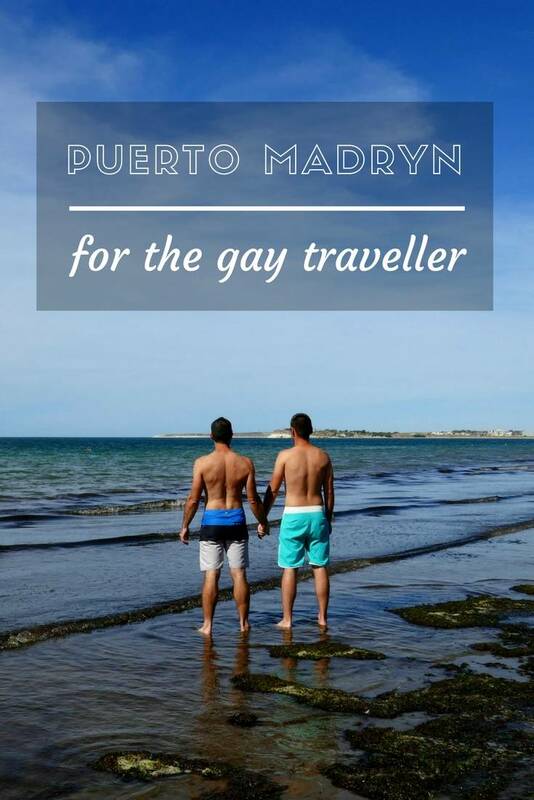 The bonus is that Puerto Madryn is one of the most unique places for a wedding and Patagonia the perfect honeymoon destination for gay couples like us who are passionate about adventure and nature: where else in the world can you get married with the backdrop of swimming whales with their babies? The gay tour company Flamenco tours can organise the entire wedding, including all the formalities as well as the honeymoon. By completing the form below, you can take advantage of an exclusive 10% discount we've negotiated for you or if you contact Flamenco Tours directly, do not forget to quote the discount code NOMADIC10. Swimming with sea lions: we had previously snorkelled with sea lions in the Galapagos and in Lima, Peru. 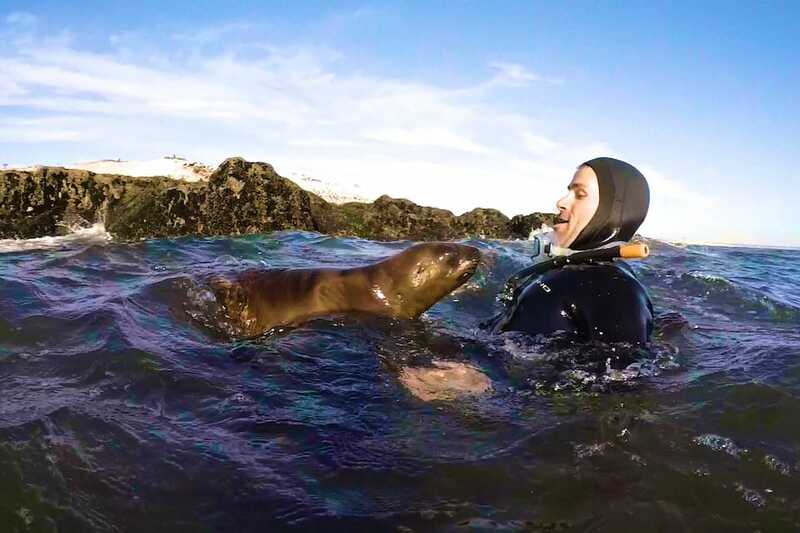 In Puerto Madryn you can get even closer to them with curious, playful sea lion pups climbing on you in the water. This was one of our favourite memories from Puerto Madryn. Sea lion tours can be done all year round at Punta Loma. Whale watching: we loved whale watching in Sri Lanka and were excited to do the same in Puerto Madryn. This is one of the most famous spots in Latin America where you can see whales and their babies. If you go scuba diving to see the famous wreck near Puerto Madryn, there's also a high chance of seeing whales during the dive. The whale watching season runs from June until early December. Conversations with penguins: Punta Tombo is home to the largest colony of Magellanic Penguins in Latin America. They are less than 50cm tall and absolutely adorable! They arrive in late September to nest and mate. The chicks are born in November and stay with their parents for around 3 months. By the end of April, most of the penguins will have left. Punta Tombo is around 2 hours drive from Puerto Madryn. Orcas (killer whales): after watching the sad Black Fish documentary, we really wanted to see orcas in the wild. They swim past certain spots in Peninsula Valdez to hunt their prey, which are sea lions or Elephant seal pups. We were lucky enough to spot them, but not quick enough to take a photo. Dolphins: Commerson's dolphins can be seen throughout the year with a boat tour from Rawson port. They are smaller than most dolphins with a unique black and white pattern, similar to orcas. It's not always guaranteed to see them, but tours allow you to return on the same ticket if this happens. Rawson is around 1 hour drive away from Puerto Madryn. Elephant seals: Peninsula Valdez is the place to come to see elephant seals in the wild, particularly at Punta Norte and Caleta Valdez. They can be seen all year round, with the highest activity during their breeding season from December to March. 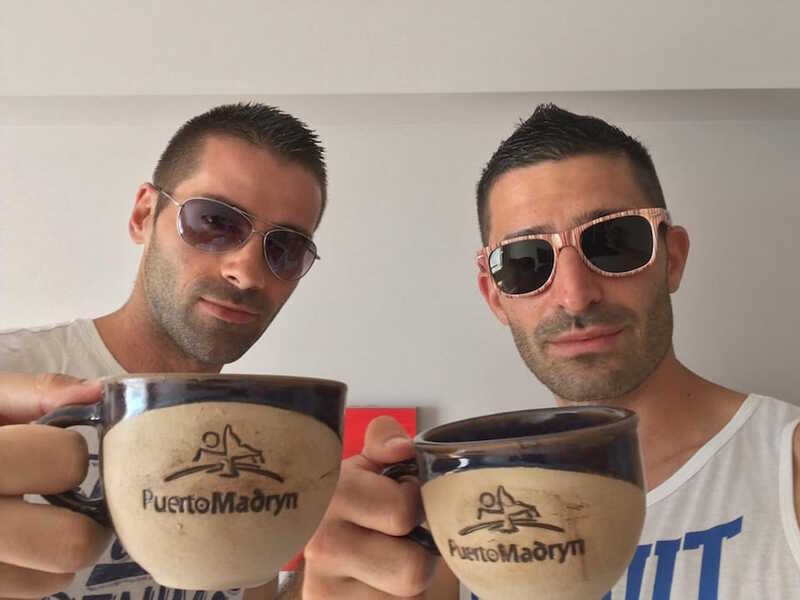 We've arranged some of our tours with Flamenco Tours, a gay travel agency based in Puerto Madryn. By completing the form below, you can take advantage of an exclusive 10% discount we've negotiated for you or if you decide to contact Flamenco Tours directly, do not forget to quote the discount code NOMADIC10 to get 10% off. Wow. Never knew about gay marriage being legal since 2010 in Argentina. This shows you can be a conservative country on some levels but progressive too. Good deal. Amazing wildlife as well. Patagonia is one of my ultimate travel experiences. Thanks for the share Boys!